Greetings everyone! I’m super excited to see those traveling to Midwinter in just a few days. In case you missed it, here and here are links to ALSC Blog posts from last week to help you navigate (and enjoy) Seattle. And, here is a link to my previous blog post highlighting various ALSC engagement opportunities at Midwinter. In this post, I’m sharing a few more opportunities for you to participate in ALA information and feedback sessions, and providing a few last minute reminders about various ALSC related meetings. 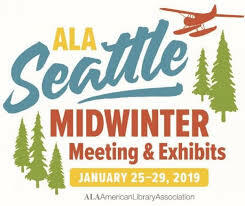 For those of you unable to attend Midwinter, you can keep up with happenings here via our live ALSC bloggers or follow #alamw19 on social media. ALA has numerous projects in the works to build the capacity to support the profession’s transforming needs. During Midwinter, there will be several opportunities for members to contribute feedback to draft concepts that are being presented around the future of Midwinter and organizational effectiveness/governance models. For the past two years, the ALA Conference Committee has discussed the future of our Midwinter meeting. Options are to (a) change Midwinter, (b) eliminate Midwinter, and (c) eliminate the present Midwinter but replace with an alternative event. Conference Services has provided the committee with a potential model for a new, alternative event to replace the Midwinter meeting in January 2021. This model will be discussed by the committee at their meeting on Saturday, January 26, 2019 from 10:30 to 12:30 p.m. at the Seattle Convention Center, Room 3B in order to provide Conference Services with feedback. Both Conference Services staff and Conference Committee members will be present at the Town Halls. If you are able, I encourage you to participate as ALSC leadership wants to ensure the youth divisions’ perspectives are considered and part of the conversation. Discussions of the proposed model will continue in ALA Connect after Midwinter in Seattle. A Steering Committee on Organizational Effectiveness (SCOE) is working to carry out a comprehensive review and study of ALA’s governance, member participation, and legal structures and systems, with the goal of proposing changes that will revitalize its success, strength, and agility as a 21st century association. The group is being assisted by consulting firm Tecker International. All ALA members and staff are invited to contribute to SCOE’s work at various sessions during Midwinter. I encourage you, as informed and engaged ALSC members, to take advantage of this opportunity to provide feedback. As mentioned in my previous blog post (Jan 1) about Midwinter, the ALSC Board will be meeting on Saturday January 26 and Monday January 28th to discuss a variety of topics related to our proposed budget, awards, and committee work. We’ll be reviewing and discussing recommendations from numerous committees and task forces. The ALSC Board Documents for the Midwinter meeting are now available on ALA Connect (Note: ALA login required). Among the topics to be covered are: (1) a review of the ALSC Strategic Plan implementation progress, (2) a proposal from the Education Committee for cultural humility training, (3) an examination of the first draft of the Project LOCAL white paper, (4) recommendations from the Awards Program Review Task force, (5) recommendations from the Pura Belpré Expansion Task Force, (6) the work and charge of the Oral History Committee, (7) recommendations from the Early Literacy Next Steps working group, and (8) an examination of ALSC’s current and proposed budget. ALSC Board Meetings are open to conference attendees. However, please note that the Awards Program Review Task Force agenda item will be held in Executive Session due to partnership, sponsorship, and other privileged information that requires confidential discussion. Board actions on our various agenda items will be reported after the meeting. I understand many ALSC members are not able to get to Board meetings during conference, but having access to the aforementioned documents allows you to stay up to date on policies, issues, and discussion topics affecting the work of the Association. Our Association’s work and success stems from committee activity and the passion and engagement of our individual members reflected in many of these reports. Thank you for all you do to keep us moving forward! For more information about the Midwinter Meeting, including meeting times and locations, please visit the Conference Scheduler: https://www.eventscribe.com/2019/ALA-Midwinter/. You can limit your search by ALSC events and meetings. My previous January 1st blog post, highlighted several ALSC Midwinter meetings, including our News You Can Use Session and Leadership and ALSC Meeting, but I wanted to call your attention to two final opportunities. On Friday January 25th from 8-10 pm at the Sheraton Seattle Hotel, Willow Room, the United States Board on Books for Young People (USBBY) will offer session co-sponsored by ALSC/YALSA/AASL and made possible by Scholastic. During the meeting, attendees can learn about the titles on the USBBY’s 2019 Outstanding International Booklist and hear from #ownvoices debut author Aida Salazar about how children’s literature can rise from a place of love to endure, resist, and transcend volatile political times. A complimentary book signing will follow the presentation. On Monday January 28th, the Youth Media Awards (YMAs) Press Conference will announce the 2019 children’s and young adult literature award recipients at 8 a.m. PT, on Monday January 28 at the Convention Center, Ballroom A-C. The live webcast will be available at http://ala.unikron.com and through ALA/ALSC’s social media channels. This year’s YMA Press Conference promotion and joint ALSC/YALSA youth reception is made possible by the generous support from Baker & Taylor, a Follett Company. If you are attending Midwinter, please drop by the Baker & Taylor booth and/or join us at 5 p.m. on Monday evening at the ALSC/YALSA Youth Reception at the Sheraton Seattle, Ravenna Room, and thank our sponsor for their generous support! Finally, please mark your calendars for the next ALSC member Community Forum on February 12 at 12 Noon Central! It will be held via Zoom so you’ll need to follow the link to pre-register for the Forum. 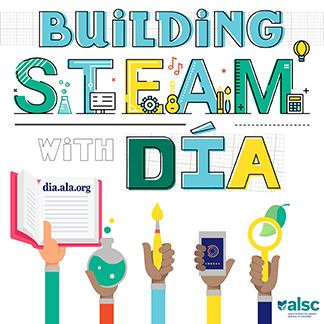 We’ll share highlights from Midwinter and other ALSC happenings, and provide an overview of two new ALSC initiatives in our ongoing commitment to support librarians as media mentors in their service to children and families. First, we will discuss the 2018 updated version of ALSC’s first national survey of libraries and new media, originally administered in 2014, which demonstrated a strong commitment among libraries to providing a range of technology for families with young children. The new survey offers compelling, widespread insights into the changes to this still largely uncharted and varied landscape. 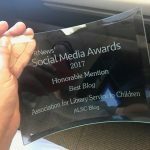 Following this, we will share information about ALSC’s two new achievements related to media: ALSC’s brand new Excellence in Early Learning Digital Media Award and the Notable Children’s Digital Media (formerly Great Websites) list. Join us to learn about these new achievements. For those coming to Midwinter – I wish you the safest of travels and hope you have a productive and enjoyable meeting. And, for those unable to attend, please take advantage of the numerous opportunities to stay connected. Thanks again for all that each of you do every day to engage communities to build healthy, successful, futures for all children.